Being fluent in a second language offers numerous benefits and opportunities. In today’s world there are more than 7,000 languages, and learning at least one language other than English will help you greatly excel. In the United States, one of the most spoken languages, other than English, is Spanish. More than 15 percent of the population in Bonita Springs speaks Spanish, and learning and being fluent in this language is of great benefit in the real estate industry. Whether you are buying or selling real estate, being able to communicate with the Spanish speaking market in Bonita Springs will open new windows of opportunity and help you achieve your real estate goals in a quick and efficient manner. It also allows you to have an extra edge over the rest of the competition, because you can cater to a small niche of the market that is extremely important. More than 30 percent of the Bonita Springs community is Hispanic, which also means that you are likely to encounter neighbors and other residents who are Spanish speaking. The Hispanic market remains the fastest growing demographic in the United States and economists predict that the Hispanic population will increase to more than 25 percent by 2050. A real estate transaction can be a very frustrating, confusing and emotional experience and when you are working with potential buyers who don’t speak English it can be even scarier. The Hispanic population is also very diverse and its interests are varied, which makes it difficult to cater to it. Here are a couple tips to help you tap into the Spanish speaking market to help sell your Bonita Springs home. There’s no better way to tap into a specific market than to figure out the best way to communicate with it. 18 percent of first-generation Hispanic immigrants speak English very well and more than 93 percent of their American-born children do. This means that these individuals do speak English very well, however they also like to stick to their own language as well. A real estate transaction is comprised of complicated terminology, frustration and many emotions, which makes it very intimidating. This is why learning the language so you can communicate with the Spanish speaking market will help you tap into the market, establish a different network and help you sell your Bonita Springs home. If you can’t learn the language yourself and you are interested in selling your property to a Spanish speaker, then it’s a good idea to work with a realtor who is not only fluent in Spanish, but is also familiar with the Spanish speaking market. Work with a realtor who associates with the Spanish speaking market and who understands their needs and wants. This will give you a great edge over the rest of the competition who is also trying to cater to this market. Understanding the needs and wants of the Spanish speaking market will give you the opportunity to market your property to a wider audience, which will also increase your chances of selling your Bonita Springs home in a timely and efficient manner. Numerous studies have estimated that buying power of the Spanish speaking market is stronger than ever and growing year after year. A 2012 study estimated the buying power of this market at $1 trillion, and it is projected to increase to more than $1.5 trillion by next year. The number of Spanish speaking households earning more than $50,000 annually is growing at a faster rate than the general population. 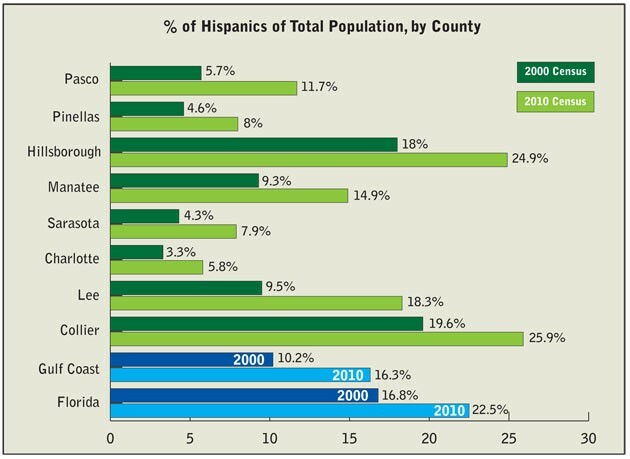 These trends will only increase as the Hispanic population continues to grow and becomes more influential. Building relationships with this market will not only help you sell your home, but if you are an investor it can also significantly improve your business. Need Help Selling Your Bonita Springs Home? There are numerous other ways you can tap into the Spanish speaking market in order to sell your Bonita Springs home and if you have any questions about selling your home or tapping into this demographic don’t hesitate to connect with local real estate experts Dan Humbert and Alberto Quiceno. The team at DNA Florida real estate is well versed in the industry as a whole and they are also well connected within the Spanish speaking community. Whether you are looking to buy or sell a property in Bonita Springs you our team is committed to helping you achieve all of your real estate goals in a timely and efficient manner without hassle, confusion and frustration. Connect with the team at DNA Florida real estate today to learn more about current listings and market trends in Bonita Springs.